A compact yet elegant tea pod and coffee machine that includes a built-in milk frother, for a wider choice of barista style drinks. Featuring a stylish, gloss black finish with chrome trim, the machine heats up in just 40 seconds and turns off after 10 minutes of inactivity to reduce energy consumption. 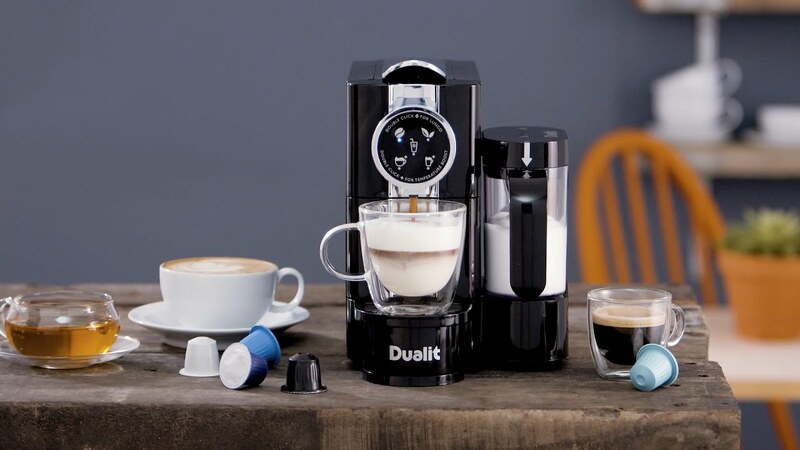 Compatible with both Dualit and Nespresso®* capsules, the Café Cino gives customers the choice of making coffee or tea, together with the convenience of being able to purchase capsules online, on the high street or in supermarkets. Precise dosing control extracts the perfect measure of espresso, Americano or tea, with a temperature boost for a hotter cup of tea. The programmable dosing memory allows you to alter the extraction, great for tea drinkers and especially useful if you want to fill a favourite cup. We know that you value choice when it comes to buying tea and coffee and we don't want to restrict that. That's why the new Dualit Café Cino Capsule Machine is compatible with Nespresso®* capsules and our own range of Fine Tea and NX® Coffee capsules. The milk is heated with steam for perfectly texturised, hot, sweet froth with an option to boost the temperature. With simple, touch-buttons to make espresso, lungo, cold froth, cappuccinos or lattes, your gourmet coffee will be ready in no time. A dedicated tea function that not only boosts the temperature for a hotter cup of tea but increases the volume. The best tasting, expertly brewed tea is poured straight into your cup within seconds; up to 90% faster than traditional brewing methods. *Nespresso trademark is owned by Société des Produits Nestlé S.A.